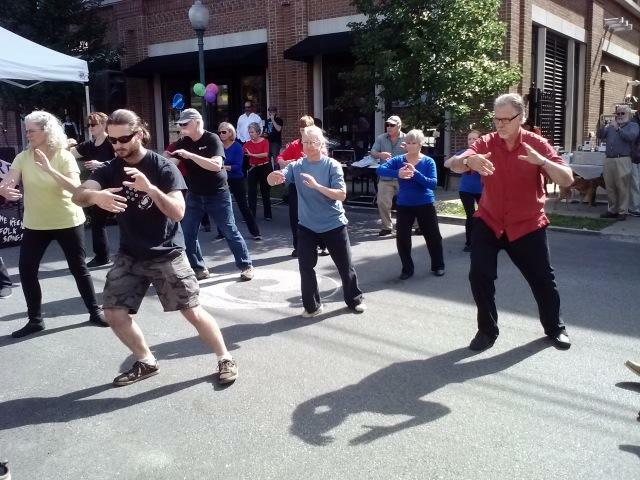 The Tai Chi Center offers many programs on Chinese energy work, meditation and internal martial arts. Classes are offered for all levels and ages. There are ongoing classes, as well as, special workshops. All classes are taught in an open, relaxed environment. This course is designed to get you started. In this course you will learn the basic postures, movements and breath work. These techniques have many benefits for health and wellbeing including flexibility, stress reduction and balance. You will also begin learning the first movements of the Yang style Tai Chi form. After this course you can continue with the more advanced level courses. Tai Chi is a Chinese Internal Martial Art that is often referred to as a moving meditation. Tai Chi has long been recognized as an excellent system for stress reduction and health maintenance. The slow meditative movements of the Tai Chi form, combined with the deep tranquil breathing, create a sense of centered well-being that helps reduce stress, increase balance, increase internal energy and relax the body and mind. Tai Chi is suitable for anyone regardless of age or physical condition. The movements are relaxing and easy to do. Tai Chi can be practiced anywhere at any time. No special clothing or equipment are required. Tai Chi is becoming increasingly popular in this country and for many people, is an important part of daily life, helping them to stay calm and relaxed in the hectic pace of today's society. Daily practice of Tai Chi helps to keep both the body and mind clear and free flowing. For martial artists, Tai Chi is an excellent method for developing coordinated internal body mechanics which lead to vastly increased speed and power. Qi Gong (pronounced chee kung) sometimes spelled Chi Kung, is the ancient art of Chinese energy work. Qi (or chi) means energy or life force - Gong (kung) means work. Qi Gong has three main branches: Medical Qi Gong - for general health or for treatment of a specific condition. Martial Arts Qi Gong - for strength, speed and internal power. Spiritual Qi Gong - from Taoism, Buddhism and Confucianism. All have in common the coordination of mind, body, breath and the flow of internal energy. All Qi Gong practices involve focusing the mind and breath with standing, sitting or moving meditation. Some practices will have broad movements while others use only the mind to move internal energy. The Tai Chi Center offers many different Qi Gong courses, including Basic Taoist Meditation, Five Element Meditation, Seasonal Qi Gong and many higher level meditation practices. As well, movement sets such as The Swimming Dragon, Silk Reeling, The Eight Brocades and the Five Animal Frolics are offered.